Oh my starts that card is GORGEOUS! Such sweet eye candy!!! Lovely verse, lovely colors, lovely card! New Year's Blessings! gorgeous card and the colors used are so nice and elegant.. OMG!!! SO EXCITED about this stamp!!! Sorry for caps but I am so excited about the dies and this stamp.... the suspense is getting worse the more blogs I check out! I love the pearling around the edge of the card... it adds something extra! Also really cannot wait to get the ala cart stamp! So pretty! Love the shape! This is just so pretty! Perfect papers/stamping/sentiment. Love the die cut shape of the card. Gorgeous! Melissa, this is really beautiful! What a very elegant card! I think your Viva pearl pen dots are perfect! I love your color combinations! The black and pink look beautiful together. The little flower adds so much. Nice. Very pretty, I like the unique shape! Once again, nice work! LOVE that stamp ... so very very versatile. Happy New YEar. Gorgeous!! Love the shape of this card and all the pearl dots - perfectly Melissa! Such elegance! Love the shape of the card. Lovely card, so different from the rest! Val from IL. How beautiful! This is SO pretty Melissa! Very sweet little card! The shaped card base is so sweet! This is so gorgeous! 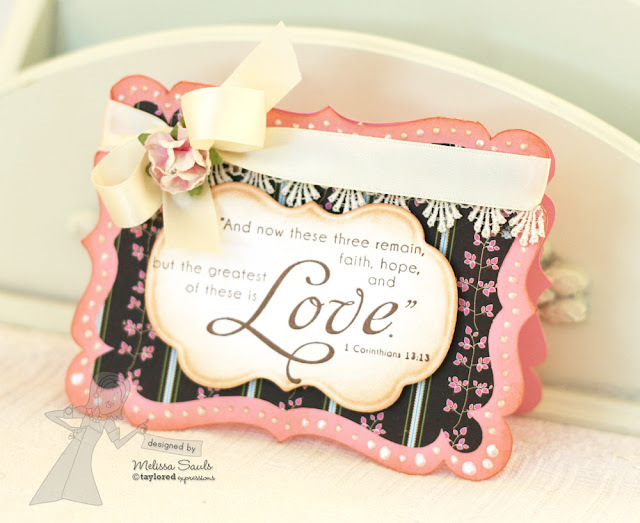 I love the pink border and that lace with the ribbon on top... wow! What beautiful papercrafting and the little detail enhance it so!Love all of the new items too. Beautiful card!! TFS!! Terrific job! !